It’s spring: blossoms ready to pop dot the forsythia branches, geese glide across my lake, I nurse a cold, and after a long time-off, contemplate the return of my teaching career. 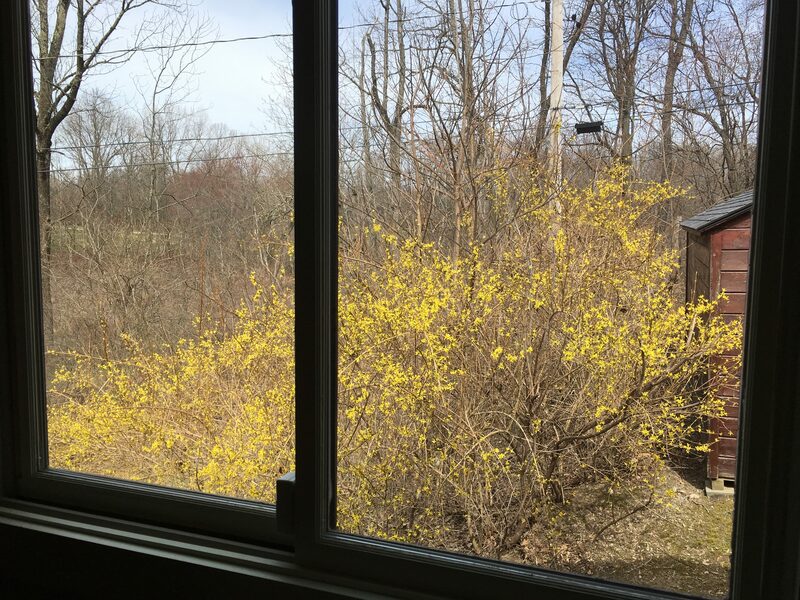 While I can’t credit the yellow buds on the bush outside my bedroom window with reviving a role I thought was over, I do believe that the cycle of yearly bloom and dormancy parallels a decade of chance and growth in my work. At the very least, the path from my last teaching gig through a more committed writing life and back again feels natural. Though I wrote haikus as a teenager, I didn’t really begin to write seriously until I landed my first teaching job at the University of Texas at Austin. I worked for the drama department carrying a mind-numbing sixteen class a week load, and after a mere six weeks, understood that if I was going to keep my sanity, I’d better find something creative to do. I had been obsessed with Edna St. Vincent Millay for years, followed her to Vassar, and decided to write about her in a one-person play. I was fixated on creating an acting vehicle, not on writing as an end in itself. But in those days I didn’t really know who I was. I look back now and see a strong writing thread tying acting, teaching, travel and my social life together. In ’79 I came to New York City to make it as an actress, armed with a second one-person play, and went on to write two more. All the while, I taught: at conservatories, tiny acting schools, respected universities, and privately, when the occasional student wanted coaching. Even after I had put acting behind me, writing and teaching continued to compete for my limited wife-mommy-artist time. While running a non-profit for writers, that I ruefully named “Tunnel Vision Writers’ Project,” and leading multiple workshops for its membership, I grew frustrated; I couldn’t summon enough tunnel vision to do my own work, and decided to walk away from teaching for what I thought would be forever. That was in 2007. A decade later, my memoir has brought that role back into my life, as organically as it had left. Last summer, before the book was out, a friend of a friend asked if I would be interested in teaching a workshop for memoirists. She knew other people, who she thought would be interested. Though up until that moment, I hadn’t given teaching again any thought, I knew right away that I wanted to do it. “Sure, maybe in the spring,” I said. After the book launch and a flurry of events, I checked back to see if she was serious and indeed she was. Last month I met with five smart, talented, accomplished women writers for two marathon workshop sessions, at the end of which, they all agreed to continue. The happiest result: I have re-discovered my love for teaching. The time off had honed and solidified what I could give students–my experience, common sense and a bit of hard-won wisdom–and re-fueled my depleted energies. I am certain that I’m a better teacher now than I was 10 years ago, and I’m eager to see where that role takes me. A week later, I stood behind my book station at the Albany Barnes & Noble’s Local Author Day, trying not to feel “less than” the couple of “Big 5” authors at the table next to mine, when a potential reader approached and asked if I could help him ready his own memoir for publication. He hadn’t read my book yet, and I doubted if he knew that I was a teacher. I told him as much, and said I’d be glad to help him. He bought the book, and the next day contacted me through my website. I dug out my old rate forms for the coaching services I had abandoned a decade earlier, adjusted the fees upward–after all, I was a published author now–and sent the information off to him. We will start working together next week. None of this would have happened if I hadn’t walked away from teaching, focused on my on work, published, and then emanated my readiness, once again, to give what I had learned to other writers. Teaching led me to writing; writing led me back to teaching. Sometimes if you release a pursuit you love, because you have to, because there are other equally pressing loves, that skill-purpose returns to you. At the right time it bursts forth like a spring flower, bright and beautiful: a full (read satisfying) circle. Then again, all of this teaching makes me itch to start my second book. Let the cycle continue!